Todays social outrage about Glenn McGrath and his hunting made me think about elephants. Yes elephants. 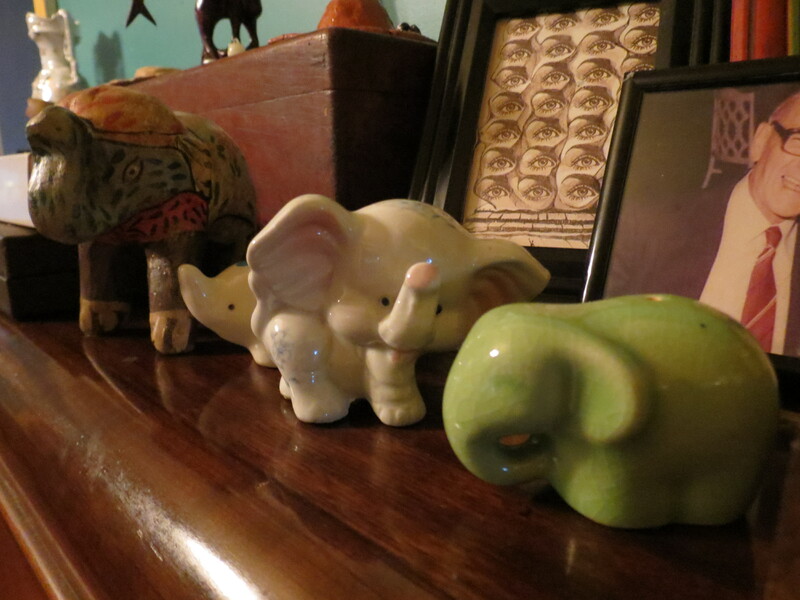 I have a liking for elephants, some may say is bordering on obsession. There are a couple of elephants around my home. No they aren’t real elephants or you would have seen had regular Twitter updates about elephants and all the fun or problems of having elephants in your backyard may bring. My backyard may be quite a number of hectares but I feel would be totally unsuitable for keeping elephants. Think of the fencing for starters. Sometimes its hard enough to keep others livestock out of my place let alone trying to wrangle a herd of elephants when they go trampling the neighbours front garden or eat their prize geraniums or are they pelargoniums. Never mind, it’s the keeping of such a huge animal that would warrant some strict examination of ones sanity wouldn’t it? But this is not what I wanted to get on about. Back to the elephants at my place. The news of today did make me reflect on why I love elephants. I do suspect it may have come from a visit to Taronga Park Zoo when I was quite small, possibly around 5 or 6. It was lucky I was small as my brother, who was quite a number of years older than I, spent much of the trudging around the zoo with me on his shoulders. I remember seeing the elephants come out of the enclosure and lumber down the pathway to the area where they were saddled up and it was there that you could climb aboard and have a slow-moving swaying journey around part of the zoo. This to me was one of the most exhilarating things that I experienced. So high up and rocking from side to side with the creaking of leather and smell of the closeness to such a wonderful animal. My next memory of an elephant in my life was when we did papier-mache in Primary School. My fabulous construction was a fantastic elephant. Made of wire and paper painted grey over a number of weeks and then proudly taken home and presented to my Mum, who undoubtedly gushed about how clever I was and what a great thing to grace our home. I never knew whatever happened to my fantastic elephant but I am sure it was pride of place somewhere in the house for a while. 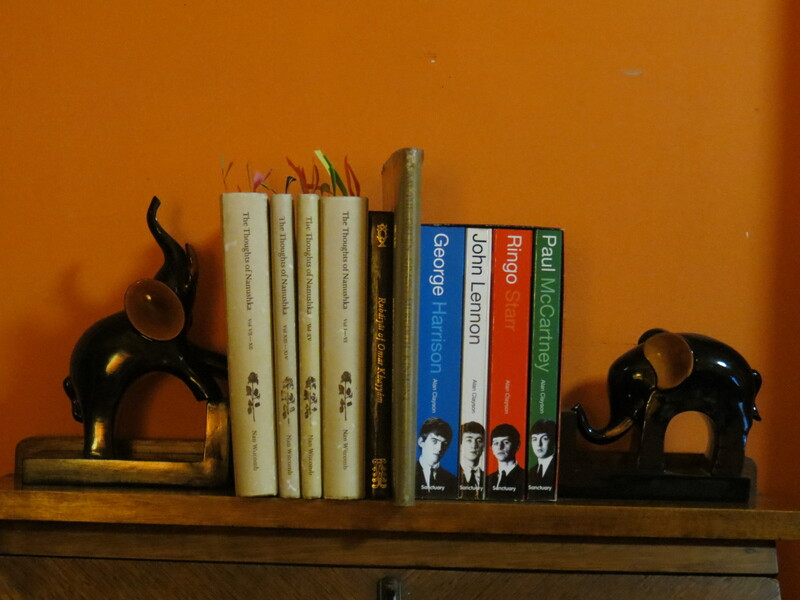 I have been told on a few occasions that I have to stop buying elephants and I have been compliant to a degree. But it seems that every occasion that arises, birthdays, fathers day, Christmas etc, others always find an elephant that I would love. 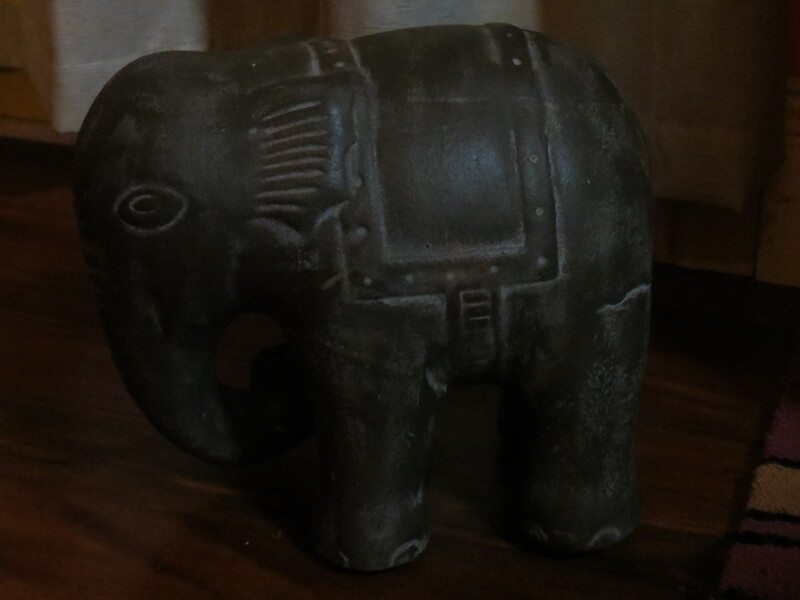 Recently after a discussion about the purchasing of elephants, my bestie and I were at The Channon Markets and she found an elephant on a stall and said how could I not buy such an adorable elephant. So you see people find elephants and think that I would just love to have it. In all cases yes I would and do. I have all manner of elephants and no I haven’t counted them as knowing a number would make me seem obsessive wouldn’t it? So following is a small number that I have in my collection. You may remember my Christmas tree and decorations from last year which I had as an elephant theme. The tree has been put back outside but I have left the remainder of the decorations on the fireplace, probably until the first cold night when a fire will be needed. The yellow tin one on the left is the only one I have bought. 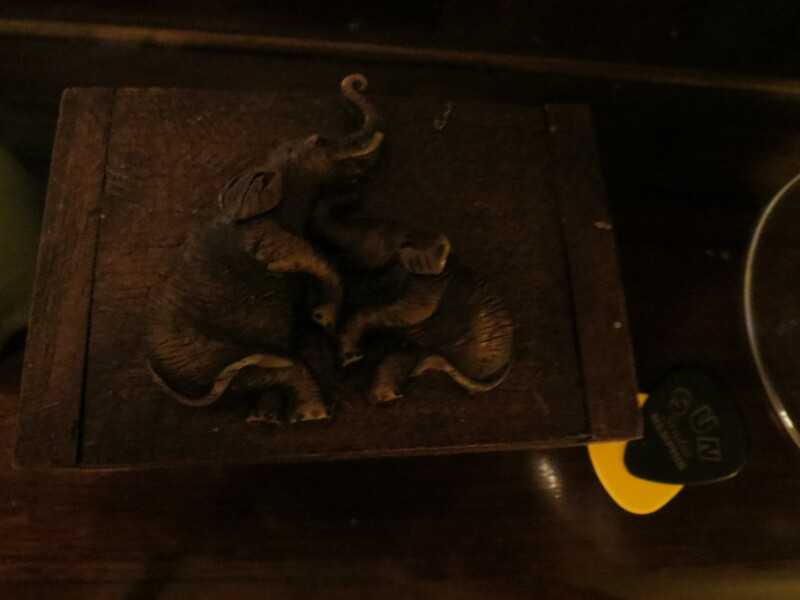 There are boxes (other items I love to collect) with elephants on them. I call this efficiency in collecting. 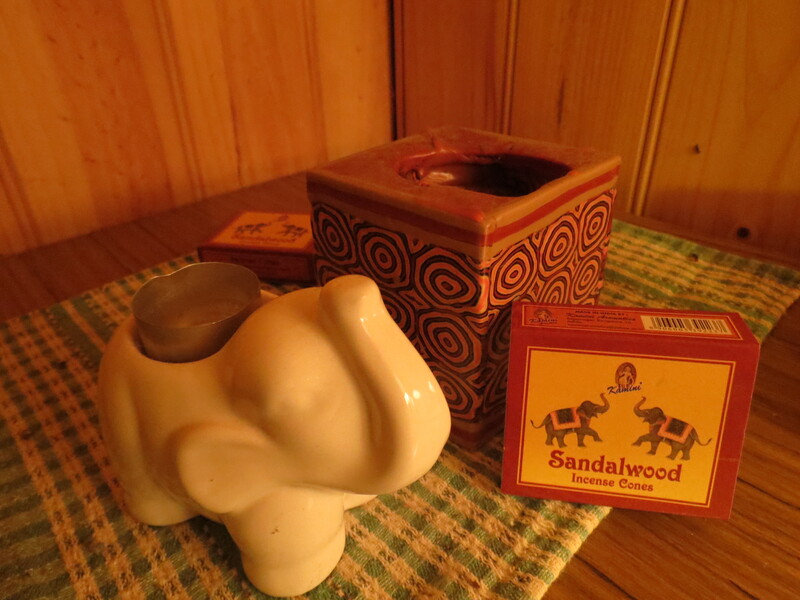 Elephants that can hold candles (this is one of three that I purchased for a reasonable ten dollars) and more boxes also with elephants on them. 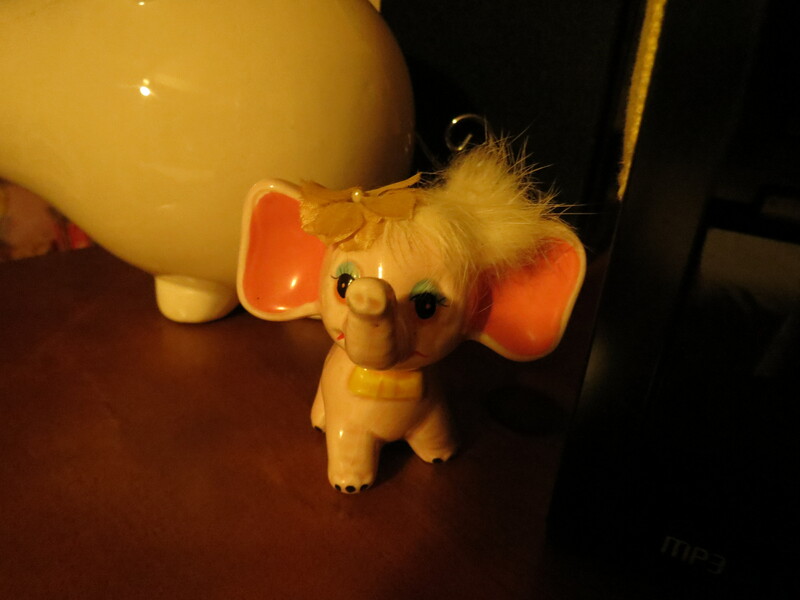 I have art works of elephants. This one was given to me by my daughter who found it in an op-shop. 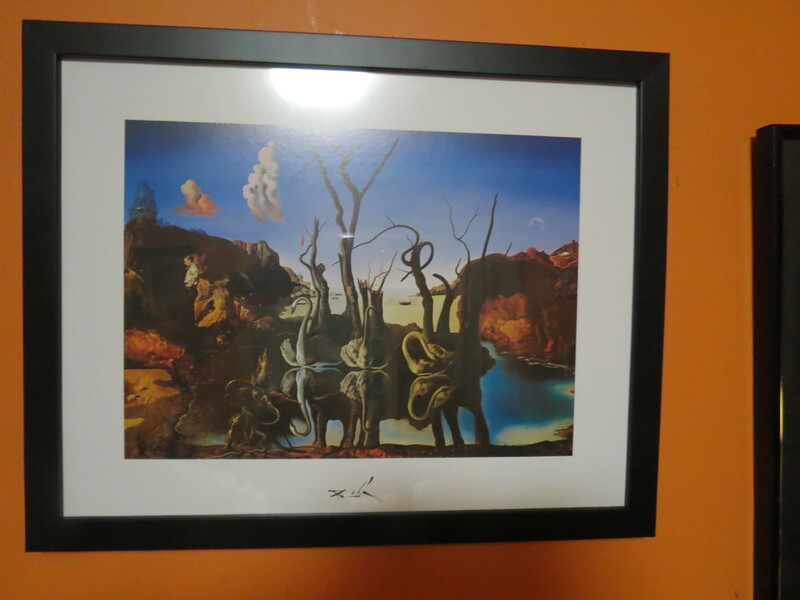 Salvador Dali is one of my favourite artists and after I saw the original in the Dali Museum in Barcelona, I decided I must have a print. 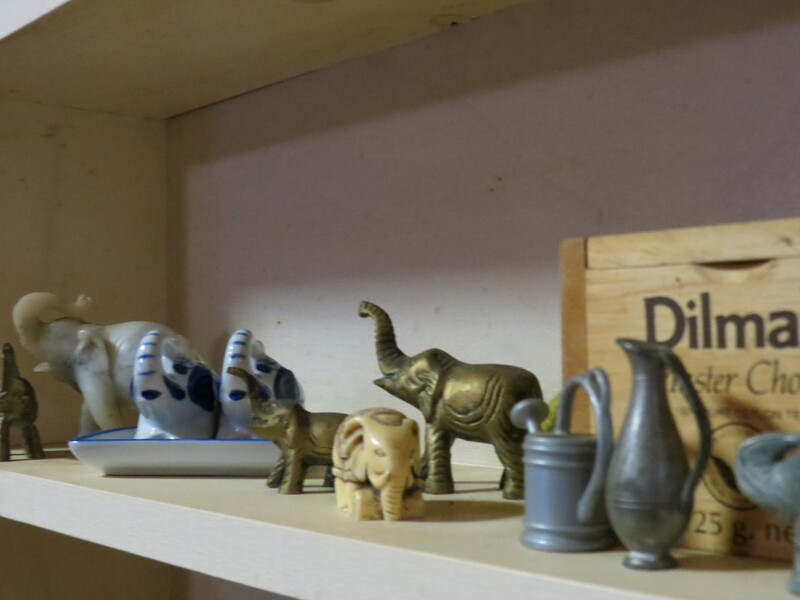 The stone elephant on the left came from Split in Croatia, the little blue and white ones I found in an antique shop in Lismore and the glass one was a gift. 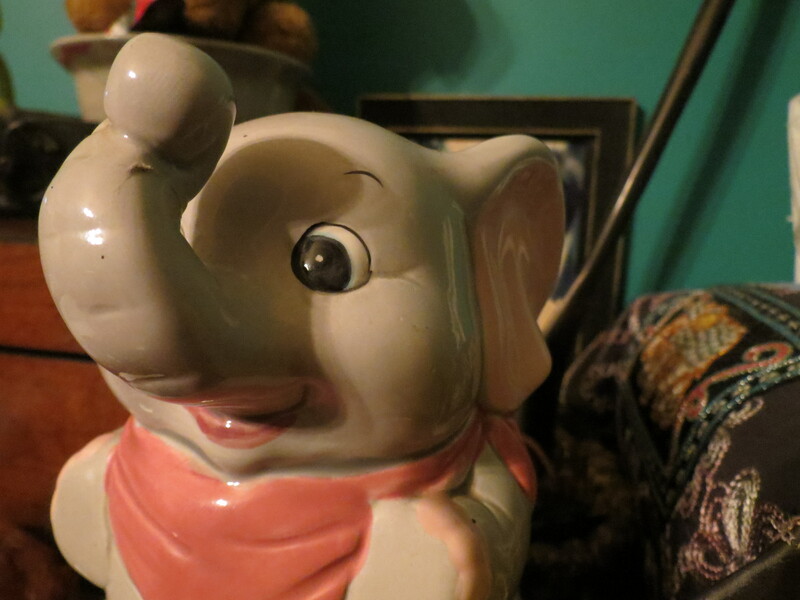 The white one in the background is another of the elephant candle holders. This little group are all presents showing differing styles and materials and methods. This is a striking fellow given to me by my bestie. It has a bit of age around 60’s to early 70’s. 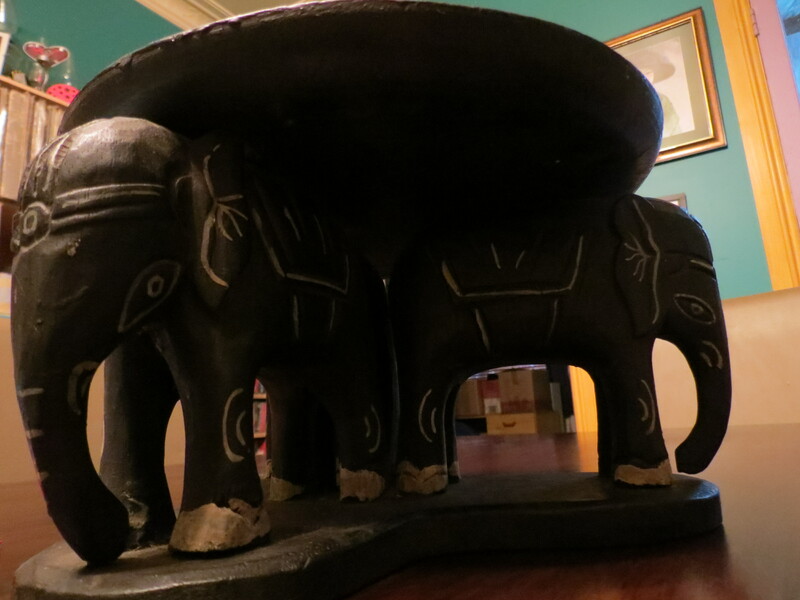 A wooden table centrepiece given to me by my daughter with three elephants holding the carved and decorated top. Another gift from my daughter made of stone who I like to have indoors. 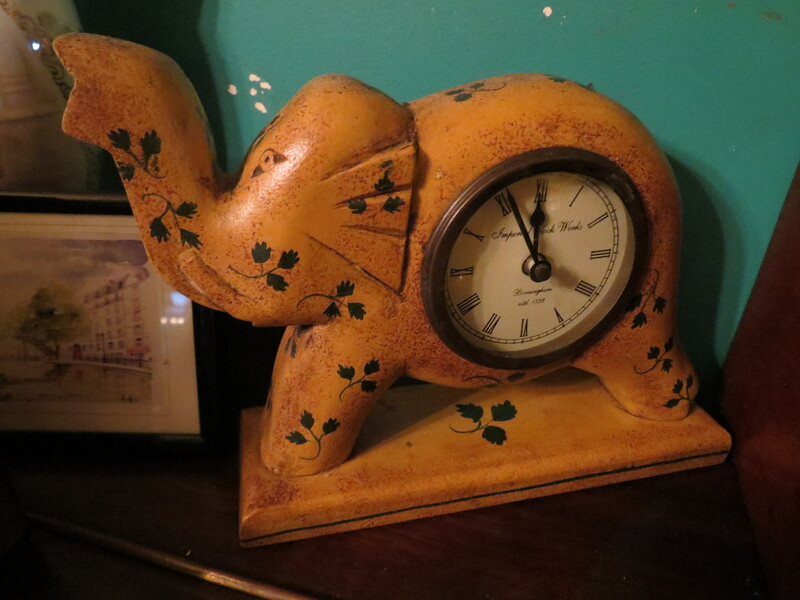 A practical elephant with a clock. Another discovery by my daughter in an op-shop. Another lot of different styles and materials from the nic-nak shelves as are the next few photos. 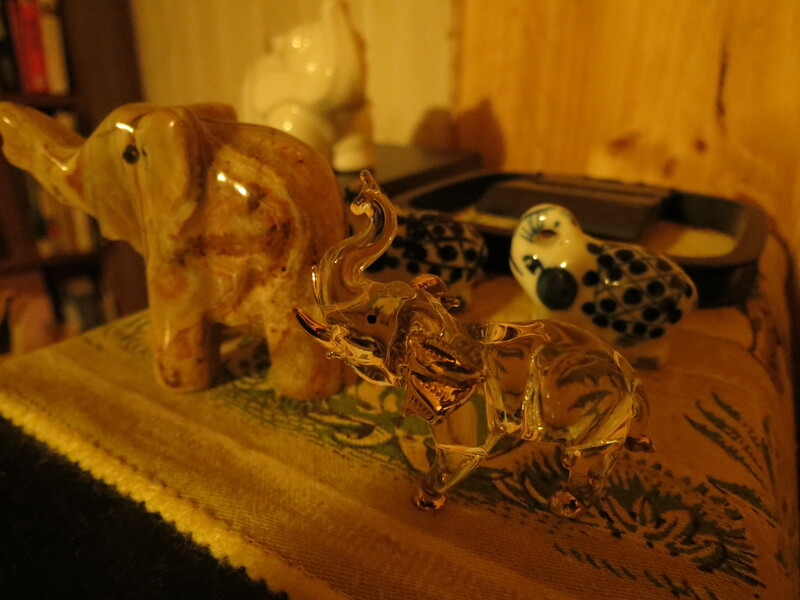 The elephant on the left I purchased in Barcelona. 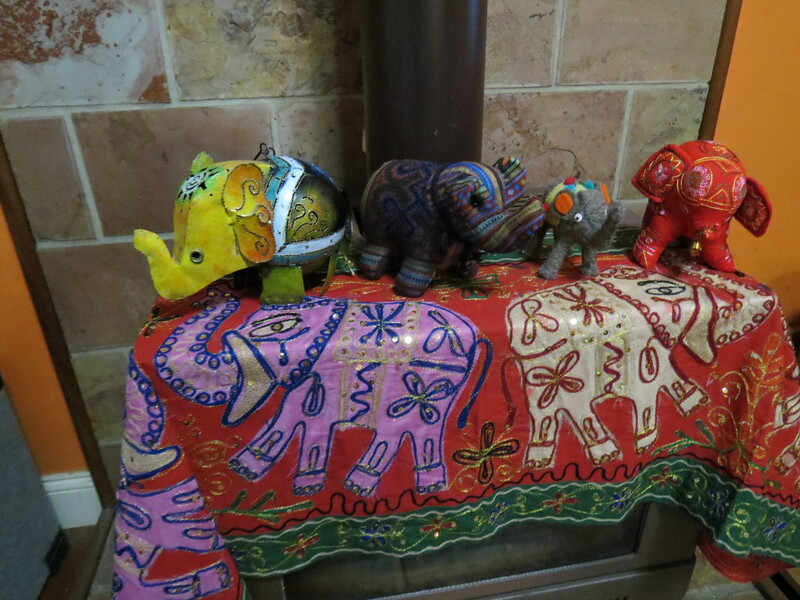 These are the most decorated elephants in my collection. I couldn’t leave out the Christmas elephant and the pillow elephant, again given to me by my bestie. 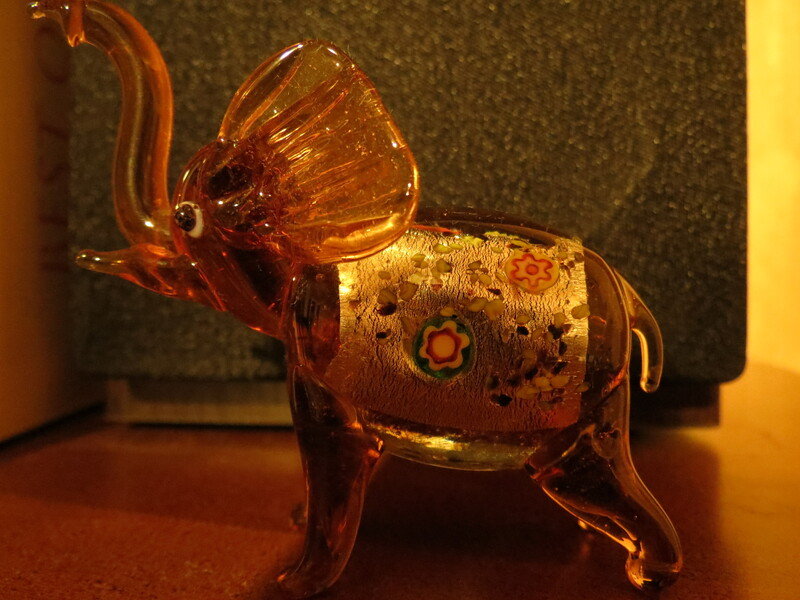 This exquisite glass elephant is one of my all time favourites. Yes I do love elephants and reading all the stuff today did make me a bit sad. PS I have three daughters so they all weren’t from the one daughter. I love elephants too. What a wonderful collection! 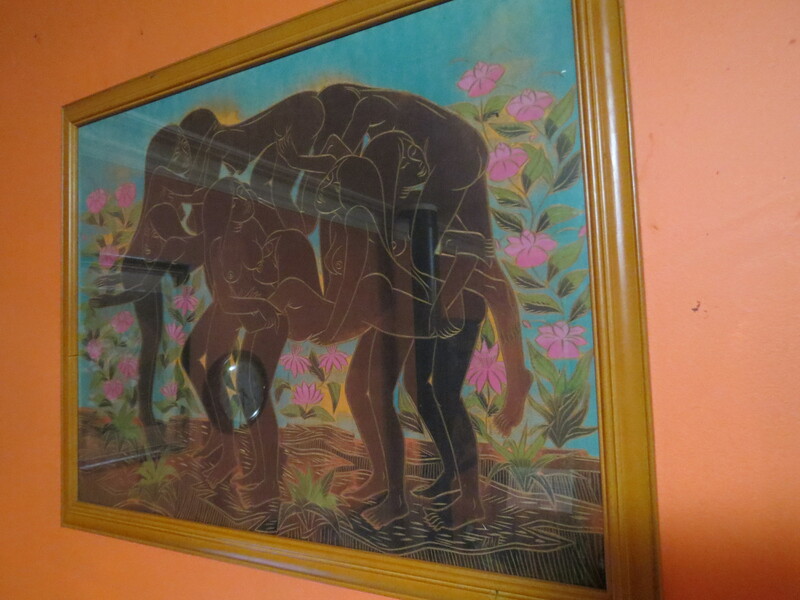 Unless my eyes are deceiving me, the artwork given to you by your daughter is rather…raunchy (and cleverly done.) Salvadore Dali is also one of my favourite artists too. 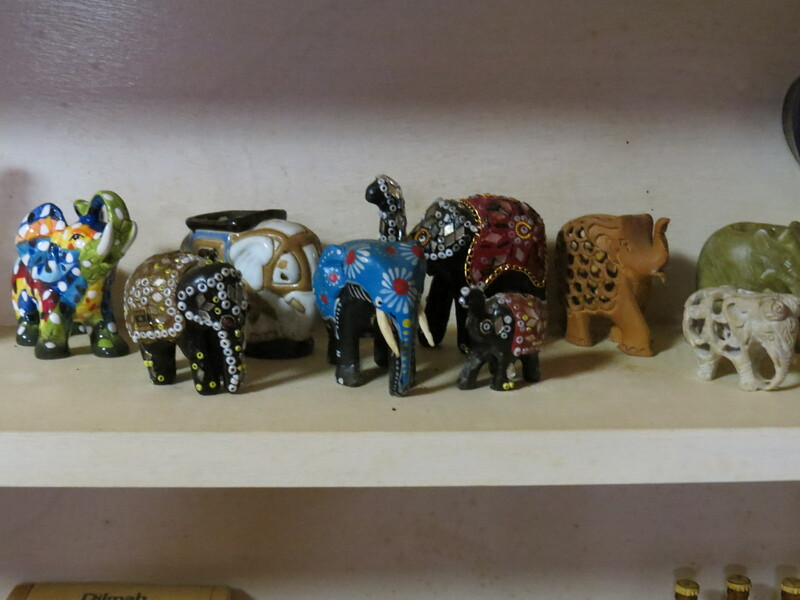 Coffee at your place would be very distracting with all those great elephant goodies! Well spotted Jane….she didn’t want me to have it in the lounge room lol I have another one done with clothed people from India. Ever since I saw “Premonition of Civil War” I was hooked on Dali.